I'm married to a great guy, Brian, and we have two kids, Lauren 23 and Jack 19. I work a couple days a week and also volunteer at Ronald McDonald House every Wednesday. We live in Shoreview and have a sweet photo-bombing Boston Terrier named Ozzie. 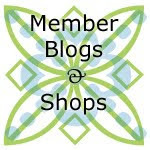 I do not have a blog or Etsy shop, but I do sell my quilts and other crafty stuff I make at a semi-annual boutique in Shoreview called The Chickadee. I do a lot of other crafty stuff. I like to use scrapbooking paper for everything BUT scrapbooking. You can modpodge that stuff to just about anything. My mom taught me to quilt when I was in junior high and I made a pillow for my grandmother and a really groovy vest for myself. I still have the pillow, but the vest bit the dust which probably is a good thing (and yes, I did wear it to school). I started quilting seriously in 2007. 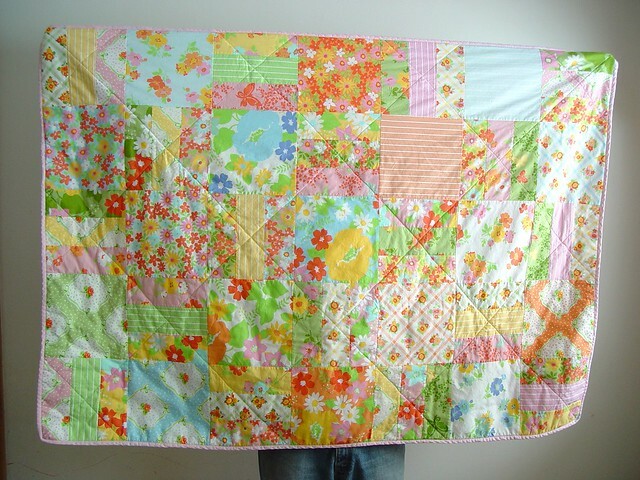 When I started sewing again about 11 years ago, I made super-duper simple baby quilts as gifts for family and friends (I am use the word "quilts" very loosely here). 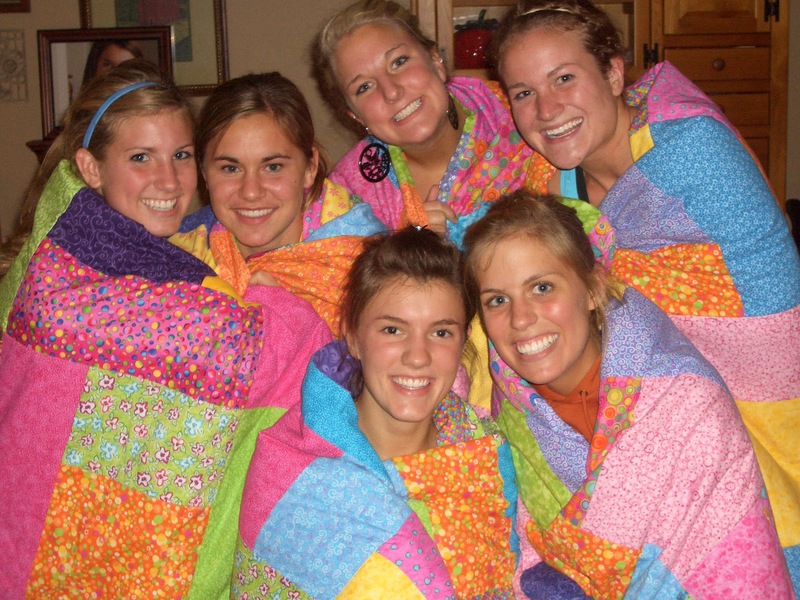 I started to “officially quilt” in 2007 when my daughter graduated from high school and I committed myself to making six full size quilts for graduation gifts for her best girlfriends. Since then it's been like an avalanche of fabric, books and blog reading. I really don't have any idea of how many I've made since 2007, but I did start documenting them on Flickr in late 2008. As far as UFO's go, I’m not a big fan of them. I feel obligated to finish what I've started even if I don't really like it. I currently have three UFO's and will hopefully finish them up this winter. This is always a hard question. 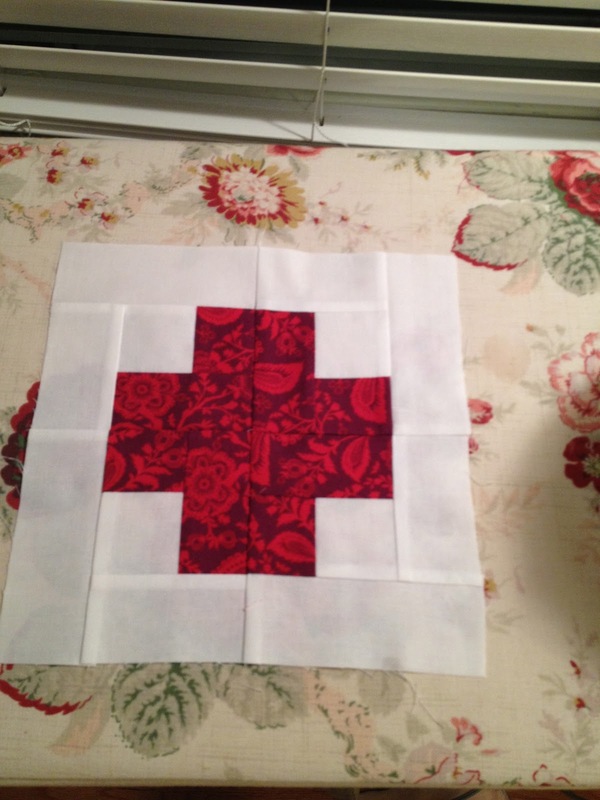 I will work on a quilt almost daily if I have a project that I want or need to have done on a deadline. I'm starting to really focus on working ahead and not waiting until the last minute, which I'm finding is much less stressful. I do, however, sew much more in the winter. On average, a couple evenings a week are spent in the "sweatshop" as my neighbors like to call it. This is the only picture I have of the graduation quilts from 2007. 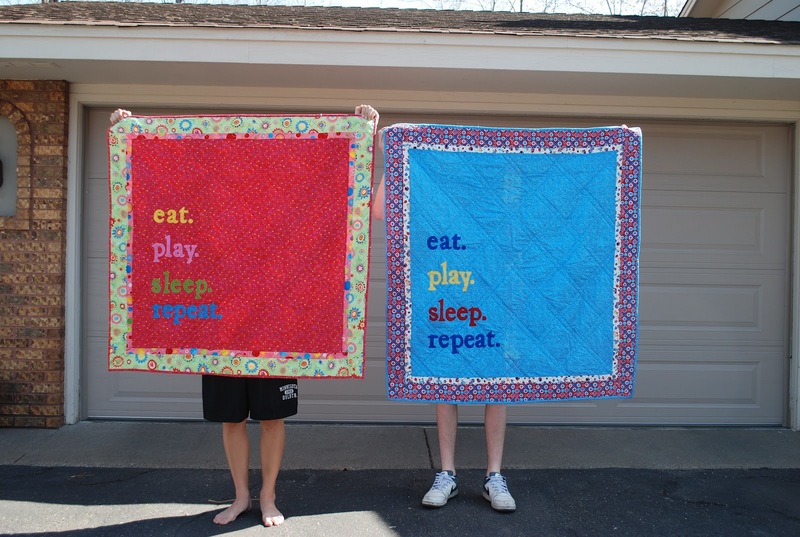 It was photographed before I realized that I like people behind my quilts holding them up, not in front of them. Please know that the fabric quality is horrid and I think some of the backing fabric isn't even real cotton (it was from Walmart's markdown table -- I was clueless about fabric back then). 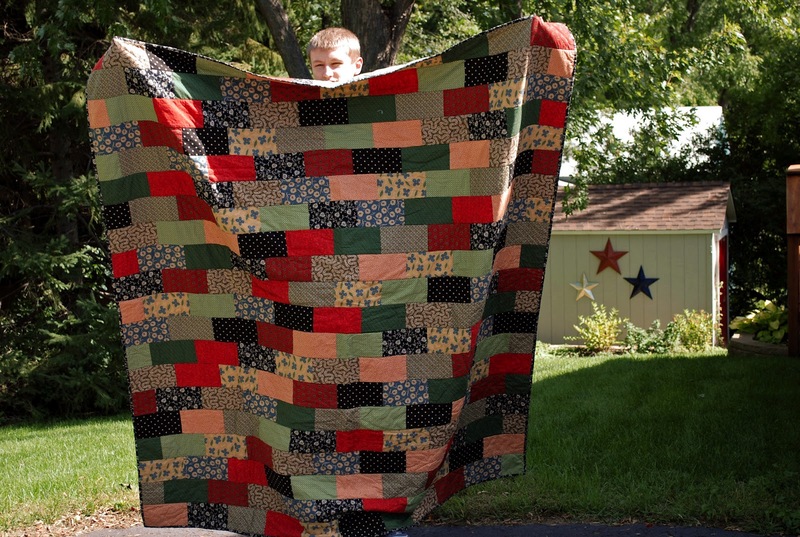 My favorite quilt is the one I made for the Robert Kaufman Kona Solid Challenge. 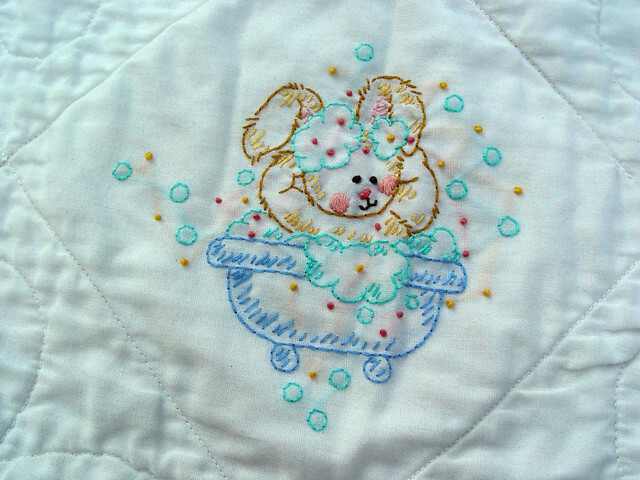 My only regret in hindsight is not sending it out to be quilted by someone who knows what they’re doing. I laid it out and put it together on my own and probably did it wrong, but I really love how it turned out and I think it photographs beautifully, both front and back. I bought a laptop computer for the house about four years ago, which was when I was able to officially take over the "office/sewing room" once and for all. It is now officially a hot mess. I seem to have the same problems that toddlers suffer from -- short attention span, the inability to cleaning up after myself and maybe a little hoarding issue (it’s not Hoarding: Buried Alive, but it’s getting close). I like to work with the TV on or music playing. I don't really drink while sewing...I tend to forget about the drink and the ice melts, it gets warm or worse, I spill it. Next to having the dedicated space, my homemade design wall is my favorite thing ever (totally copied from Film in the Fridge)! My fabric buying habit is more like an addiction and my stash an embarrassment. I have a couple of bookcases that I keep my fabric in and although it may look messy, there is a method to my madness. The good designer stuff is on the top two shelves, the solids come next and then it's pretty much a free for all after that. I sort my scraps the same way. I buy most of my fabric on line, but have put a serious stop on that until I cut into my hoarded stash of Hope Valley...oh yes, it's still sitting on the top shelf untouched. I dislike ironing my seams open, which is why I don’t do it very often. My favorite part is hand sewing the binding. For some reason, I just love it. Besides actually using the Hope Valley fabric, making a Swoon quilt (possibly with the Hope Valley fabric), and entering a quilt in the State Fair next year. Well I was terrified of free motion quilting, but since I've tried it and discovered that's it not that scary, especially with the feed dogs down—Annik, you are TOTALLY right! I'm continually amazed at what is brought to our Guild meetings. Holy cow, can you ladies make some gorgeous stuff!! I love blogs. I have bookmarked Film in the Fridge (my favorite), One Shabby Chic, Jaybird Quilts, V and Co., Posie Gets Cozy, and then it's pretty much a free for all clicking links which leads then leads to hours looking at blogs and quilts and Flickr and more quilts. Start with a pattern that is easy to follow and easy to sew. 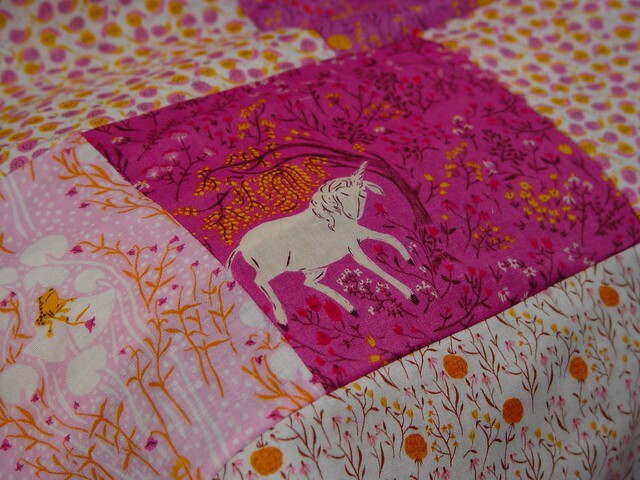 If you have a successful first quilt project, watch out because it will open up a whole new world that you never knew existed and won't believe you lived without. Anything else you would like to share? Oh, I think that's about enough. I was born in Minnesota and have lived here nearly all of my life. I am married to a wonderful man who does woodworking part time and have two grown children. who keeps me company while I quilt. mortgage business. My longarming business is part time, but it is the best job I have ever had. checked off. But since there are nearly 300 National Parks we have more roads to travel. I learned how to quilt from friends, books and the internet. The only classes I have ever taken are for my longarm. for any quilt. I really need another friend to come along side to get me on the labeling bandwagon. I keep my UFO's limited to three. That is because I keep the current projects in ArtBins which I purchased from JoAnn Fabrics. This make my current project easily portable and every thing for the project stays together till it is done. This really varies from 0 - 20. I get a lot more quilting time during the part of the year when we are not camping. I don't have a picture of my first quilt. 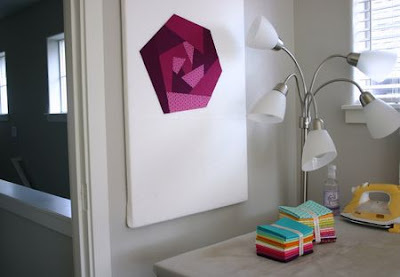 But it was a fuchsia, turquoise and black stacked rectangles that was tied with yarn rather than actually being quilted. I don't have a favorite. I like batiks a lot, but I actually have more solids in my stash. My quilting space is my basement family room where my longarm is set up. I listen to my iPod while quilting. My stash is mostly solids. I am to a point where I do not buy more unless it is going into a project. I like all parts of quilting. I find it slow methodical and calming. I like to something new all the time, a technique, a tool, or just a new color combination. 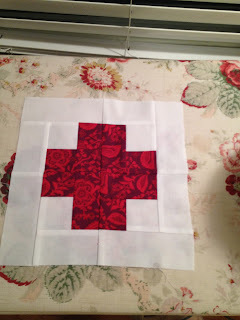 I have never made a quilt with applique. I don't think I could do that. I also am not drawn to 1930's type fabrics. See the work of other quilters. I am a Pintrest addict. Dive in. Quilting is so diverse. It is a hobby that can accommodate an "anything goes" to "obsessive perfectionism". Just start quilting you will fit in. Corduroy. Soft and richly colored—it is basically a form of velvet. The only problem is that it can be very thick and therefore very frustrating to quilt with. A few meetings ago Vanessa mentioned that she had a stash of corduroy without a plan, and I am ashamed to say, “me too!” I have had a large stack of cut up corduroy pants staring at me from my fabric stash for close to 5 years. I think it is time to finally conquer it! 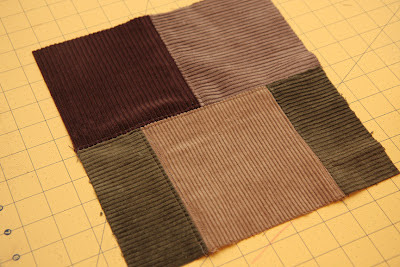 I am going to talk a little about corduroy itself and then suggest a few ways of incorporating it into a quilt without giant lumps and bumps. If you want to read even more about corduroy, check out this Threads article. Corduroy can be made from different fibers, but it is usually cotton, a cotton/poly blend, or either of those plus some spandex. The width of the “cords” in corduroy is called the “wale” and can be from 1.5 to 22 cords per inch. The smaller the number is, the wider (and thicker) the cords. For example, most men’s pants are around 4 to 11 cords per inch and are called a “wide wale” or “normal wale”. This is a fairly heavy fabric and more difficult to quilt with. 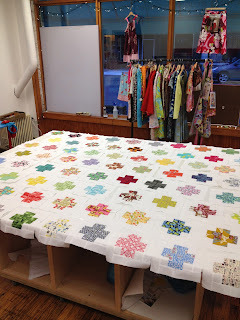 I give you a few ideas for quilting with this below. Corduroy shirts and some women’s and children’s pants are usually between 11 and 21 cords per inch and are not much thicker than quilting cotton or flannel. Corduroy with wales of 16 cords per inch or higher is also called narrow or fine wale, pincord, or pinwale. For the most part, you can treat this lightweight corduroy just like quilting cotton. Corduroy, similar to velvet, has a “nap”. What this means is that the tufted fibers in the cords want to lie in one direction only. You can feel this by brushing your hand up and down the cords—brushing with the nap will smooth the fibers, and brushing against the nap will feel rough and fluff them up. 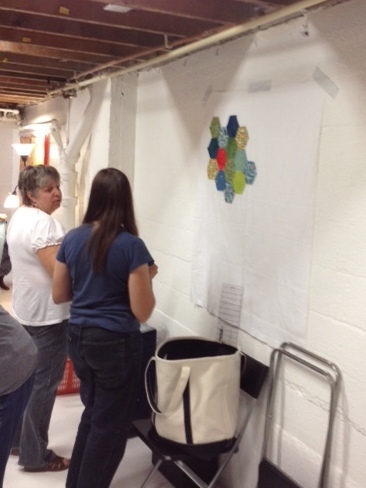 The fabric will also appear to be slightly different colors from different angles. In a quilt, unlike a garment, not all pieces have to have the nap facing the same direction, but nap is something to consciously consider when you are arranging the pieces. To acquire corduroy for quilting, you can either cut up clothing from your home or a thrift store, or you can purchase yardage at a fabric store. 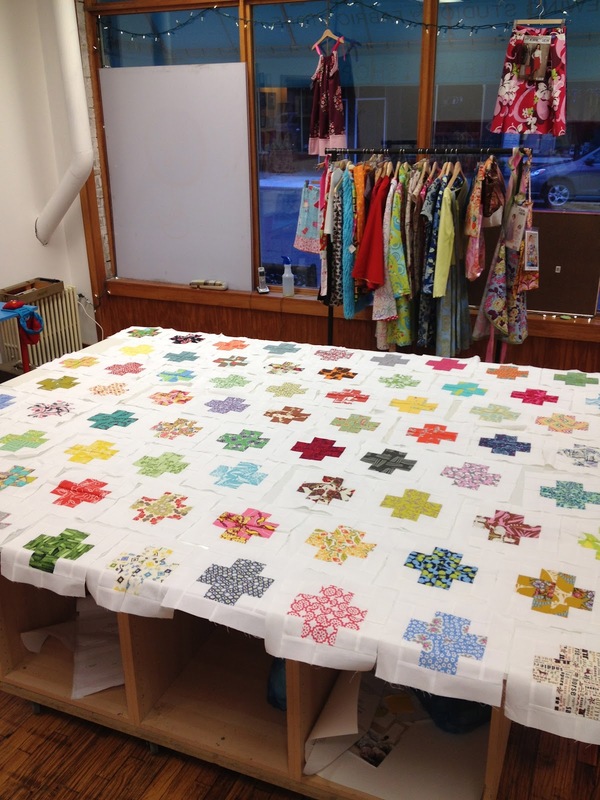 Try to choose a 100% cotton fabric if possible, and avoid corduroy with spandex for quilts as it stretches. 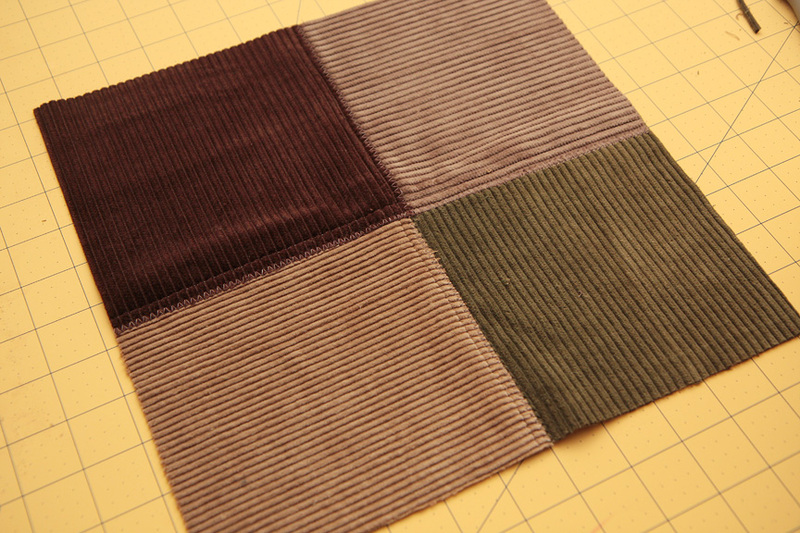 Jo-Ann fabrics in the Twin Cities carries corduroy in a handful of colors, in weights of 4, 16, and 21 wale. You can tell by the label on the bolt—it has a number like “21/w” for 21 wale. Cutting up clothing is probably the greener and cheaper option, but it will also take you much longer to collect and cut your pieces. As a bonus, though, you will get a much greater variety of colors and sizes. To save the most money, try shopping at a thrift store on sale days (for example, Goodwill in the Twin Cities has $1.49 tag day on Tuesdays) or at a thrift store outlet (such as Goodwill Outlet in St. Paul, where clothing is $1.29 a pound). Both places will vary in how much corduroy you might find in a day, and it will probably take you a few trips to collect enough for a quilt—but the hunt and collecting is half the fun, anyway! One thing to note is that corduroy made of cotton shrinks, and sometimes a lot. I would recommend you pre-wash all corduroy before incorporating it into a quilt, even if you don’t prewash your quilting cottons, and especially if you are mixing varieties or sources of corduroy. If you are cutting up corduroy from pants, it is easiest to first cut off the "skeleton", or all of the seams. This gives you four large, flat pieces to work with. I use the same method when cutting up jeans for quilts as well. When you make vertical cuts in your corduroy, you might want to forgo the quilting ruler and use your rotary cutter or scissors to cut precisely in the channel between wales. This can take a long time, but is worth it for the look it gives with all the wales being perfectly parallel to the edge of the piece. 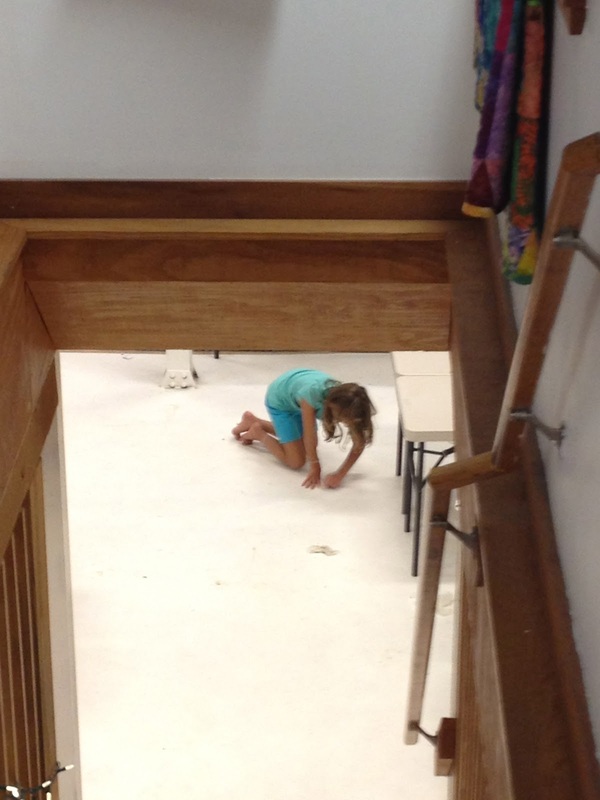 Two big problems you will run into when sewing corduroy are “creep” and fraying. When you place two pieces of thick corduroy right sides together, and try to sew them with an accurate ¼ inch seam, the pieces will shift (creep) when going through the presser foot. This can result in both inaccurate, crooked seams and a seam that is narrower on one of the pieces. To combat creep, lower the pressure on your presser foot if you can, heavily pin or baste all seams beforehand, and pull the fabrics taut front to back as they are going through the machine if they are being troublesome. You can also use an awl, stiletto, or seam ripper to hold the fabrics in place and ensure that the fabric edges stay aligned right up to the needle. You might also try using your walking foot. Corduroy frays like crazy, so if you do wind up with a narrow seam, then it will likely come apart at some point. 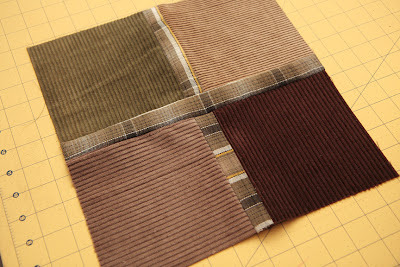 If you want to use corduroy in a durable quilt that gets used and washed regularly, use a minimum ½ inch seam allowance. For further security, reduce your stitch length slightly. This is especially true if the quilting on your corduroy quilts is minimal. Also, do a few test seams before you start your quilt; because of the thickness of the fabric you might also need to lower your tension to get a good stitch. Another tricky thing about corduroy, especially wide wale, is that it is difficult to press without marring it. If you press firmly on the fabric with an iron, you might permanently crush your cords. Finger press your seams open first to reduce bulk, and then press your seams with the right side down on a fluffy towel. Use only the very tip of the iron, lots of steam, and very little pressure. I would also consider topstitching the seams open, maybe 1/4 inch away from the seams, to ensure they stay flat. The biggest issue to me in using wide and normal wale corduroy is that the bulk created by the seams makes for a lumpy quilt. Below I suggest five different ways of getting around this, each of which succeed to varying degrees. I will also mention that both corduroy and denim share a lot of the same problems—I would also use the techniques below when I incorporate denim into a quilt (except #1, of course). Most of the ideas below also work best if you square up after every step to keep the edges even. Something that garment makers do to reduce bulk is to use electric clippers to shave off the cords in the seams. I have not tried this, but I think it would work well. Definitely practice on scraps before trying it on your quilt. This is the method I will probably wind up using, as it completely eliminates any lumps and makes the seams perfectly straight, flat, and smooth. Cut large strips or squares of corduroy. Take two pieces, both right side facing up, and overlap them on one edge by 1 inch. Lower your stitch length to 2.0mm, and stitch across close to the center of the overlap, or about 1/2 inch away from the top edge. Then, change your stitch to a wide zigzag and stitch along the edge of the top piece of corduroy, securing it to the piece underneath and reducing fraying. It will still fray some, but not too badly. Finally, stitch one more straight seam about 1/16 inch away from the widest point of the zigzag on the top piece, again using a smaller stitch. Repeat, building rows, columns, or blocks and just keep overlapping. 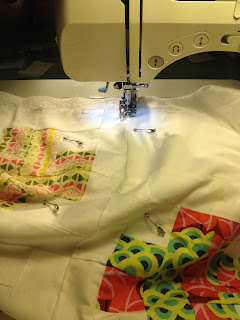 Trim any edges that will show on the top of the quilt before sewing them. If you don’t want any raw edges in your quilt, you can eliminate some of the bulkiness problems by choosing a pattern that never has more than three pieces of fabric coming together in one place. There aren’t a lot of all-over patterns like this, but you could also sew any block that has no more than three pieces coming together in the block, and then sew the blocks together with sashing that is corduroy or another fabric. Blocks could be rail fence, log cabin, Chinese coin, etc. If you want your seams to lie flat without pressing, topstitch the seams open as in the second photo, above. 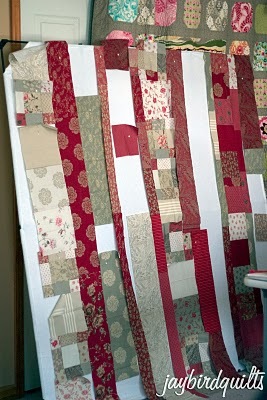 You can also just do random lengths and widths strips like in the quilt below from Nifty Quilts (photo reposted with permission). She uses a narrow wale here, but I think it would work with a wider wale, too. This pattern would also look great using the overlapping technique. 4. 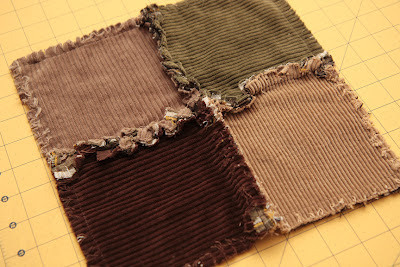 Use strips of a thinner fabric, like cotton or flannel, as sashing so corduroy does not need to be stitched to itself. I thought this was a brilliant idea when I came across it. Use strips of quilting cotton or flannel to create sashing of some kind on the outside of each block so that when the blocks are sewn together, no corduroy is sewn to itself. In my example above, I used a plaid flannel, which I would not recommend as it made the uneven-ness of the seams really obvious. Alicia of Lucy’s Quilts does this with denim, but it would work just as well with corduroy. Below is one of her many stained glass denim quilts (photo reposted with permission). What I especially like about her pattern is that it would use up all but the smallest scraps if you are harvesting corduroy from clothing. 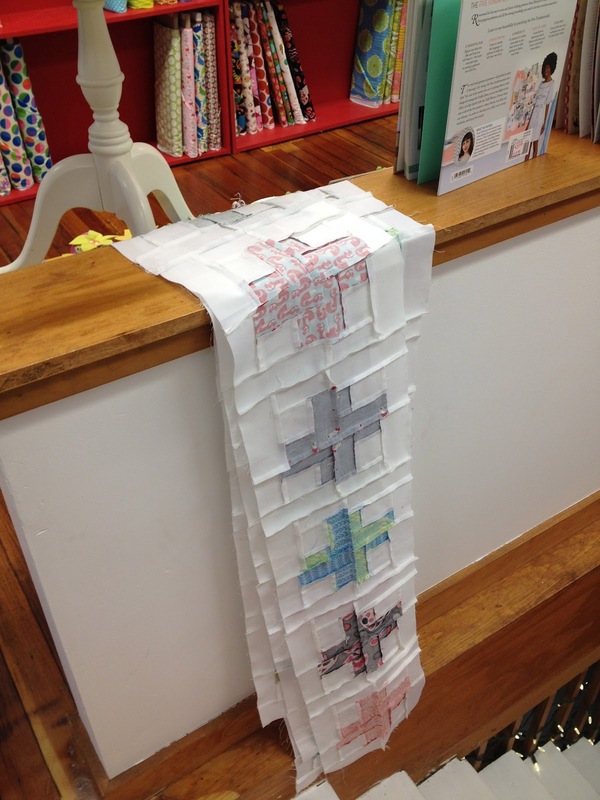 She says she uses 2, 4, 6, 8, and 10” squares for this pattern, and 1” strips for sashing. If you are applying this to corduroy, I would suggest using 2” sashing strips, a ½ inch seam allowance, and pressing or topstitching the seams towards the sashing. If two adjacent pieces of corduroy overlap underneath because your fabric crept during stitching, just trim the seam back a little. Another example that would work well and I think would look gorgeous in corduroy is this pattern by Mary of maryquilts (photo reposted with permission). A pattern is included on her site. 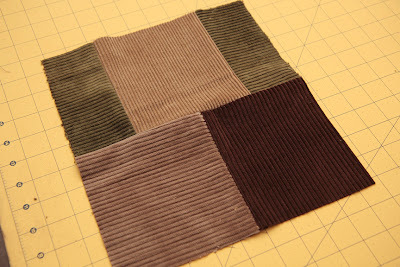 Notice how if you used corduroy for the center of each block and quilting cotton or flannel for the outer strips on the block, that no corduroy would be sewn to itself. The last and probably one of the best options is to make a rag/raggy/fringe quilt. There are already so many great tutorials out there (including the three below) that I don’t think I need to write another one. I would use another soft fabric for the backing, such as flannel. You can make it so that all the corduroy is on one side of the quilt, or you can mix and match so both sides of the quilt are half corduroy. This makes a wonderfully heavy, warm, and snuggly quilt that is perfect for the car, picnics, or the couch. The bonus of using corduroy and flannel is that it would already be very warm, so the batting is optional. No batting eliminates the tricky part of centering the batting, makes quilting optional, and makes this quilt very fast to make. The raggy seams also hide any slight creep where the seams don't line up perfectly or where the wales wind up not perfectly parallel to the seams. Once you are done your quilt top and are ready to quilt it, you have a few different options, but I would keep it simple. A few lines in the ditch, straight across, or at an angle across the quilt should be all that is necessary, especially if you omit the batting. Personally I would choose random lines as it would be much more forgiving of wobbles than trying to stitch in the ditch. 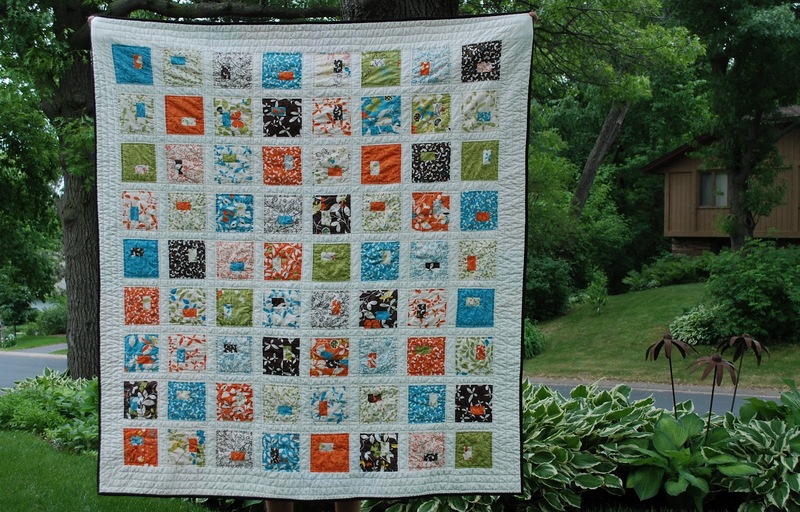 You can also always just tie the quilt and forgo quilting altogether. 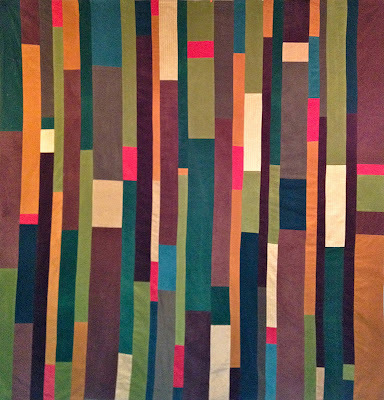 I hope this inspires you to try using corduroy in a quilt! Hi everyone, it's Tracy (the one that likes to makes big quilts) and I’m blogging today about how I take photos of my finished quilts. Please know that I am not a skilled photographer -- I have a computer overflowing with quilt photos and a Flickr account, that's about it. This is just a quick overview of how documenting my quilts has evolved over the years, much like my quilting. I started with a pretty basic concept – throw the quilt on a piece of furniture and take a snapshot. It then dawned on me that there are tall people lounging around the house that are perfectly capable of holding them up. But I still took pictures inside the house without taking notice of my background (that’s the dog...little photo-bomber). He can, however, shoot a fine “stink eye” at me when pushed too far. These clamps are from the husband’s tool bench and work great. I take them, a quilt and hit the wooded paths down the street from our house. I can hang quilts from the walking bridges or low tree branches, take some pictures and move on. Lately my husband has jumped on the quilt picture taking bandwagon and has become my go-to quilt holder. He, however, has much less stamina than our son. I’ll be shooting away and all of the sudden the quilt drops and he’s all like, “Isn’t that enough?” or “There’s no blood in my arms!” Blah, blah, blah. I recently discovered my new favorite spot for pictures near our home. It’s an original farm house built about 150 years ago with an old barn and outbuilding. It’s amazing how lovely a perfect stranger can be when you introduce yourself as a quilter and ask if you can use her buildings for backdrops for your quilt photos. 1. Look for backgrounds that have texture, interesting color, contrasting color, or depth of field in order to have your quilt stand out in the photo. 2. Cloudy or overcast weather is better than bright sun. 3. Don't be shy; people love quilts. If you see someplace that would be perfect for a picture, ask if you can take some pictures on their property. 3. Learn how to crop your photos on your computer. 4. And most importantly, always consider bribery in order to get someone to hold up a quilt for you. 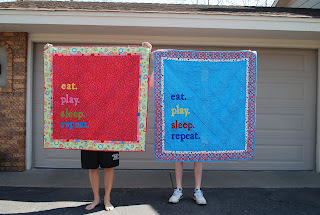 So get out there and take pictures of your quilts. Be warned though, once you get started, it’s hard to stop. This last photo is one that I took from my neighbor’s deck using her hammock below as a quilt holder.